You can add any program as an external tool in HippoEDIT. The tools can be as executable (*.exe, *.com), as batch file (*.bat), as registered script file (*.js or *.vbs). Tools are syntax dependent (connected to the main syntax of the document). If you want the tool to be available for all syntaxes, assign it to Default (or to Default Source to be available for all source files) syntax. You can move tools between different syntaxes, create a separator between tools or create tool folders with the help of Manage Tools dialog. For some kind of the tools (console executable or scripts executed by console processor) you can catch tool output. 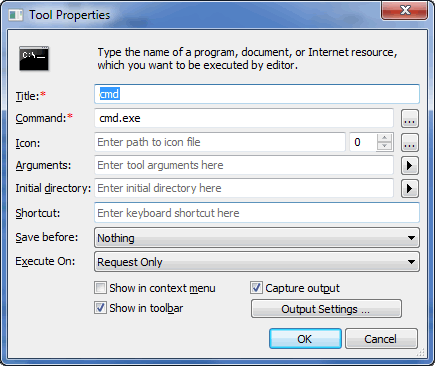 For every tool in addition to title and command, you can set arguments and initial directory, configure the editor to save all files before executing, use big set of built-in tags (interactive file or directory, file name, line number, project directory, registry values, clipboard content, environment variables) as parameters. Title of the tool. The text that will be shown in menus and ToolTip for tool button. Parameter is obligatory. Fill first Command field, that Title field will be filled automatically. Most important field - here you need to provide path to your tool. If no path is provide and only name of the tool is given (as cmd on example) HippoEDIT assumes that he need to search tool in common PATH folder and in current directory. You can use here as path parameters built-in variables, user variables or environment variables. If you want to open a file using default associated program outside of the HippoEDIT (ShellExecute), and do not want to explicitly define the path to the registered application in the Command field, you can put in a direct name to data file you want to open or put FileName tag, to insert name of current file. Icon to be associated with a tool and displayed in Toolbars and menus. You need to provide at least path to icon file. Number right to icon path field indicates icon number in icon resource file (can be used with DLLs or EXE files). If nothing is provided editor will use the associated icon (by extension) or first/default icon if binary file selected in the command field. Command line parameters you can pass to the tool. Please do not put them inside of command field. You can use here as path parameters built-in variables, user variables or environment variables. Check helper menu oh the right of field for allowed built-in variables. If you want that you tool has initially some specific directory set as current directory you can place it here. You can assign a shortcut to the tool. The shortcut has priority over default shortcuts from current keyboard schema (as by code templates) and in a case of the conflicts will be executed instead of command from general mapping. So, in the case of warning during shortcut assignment, you can ignore it if you know what you are doing. Show in Context Menu - if set, the tool wil be shown in the editor context menu. Default is Off. Show in Toolbar - if set, the tool wil be shown in Tools Toolbar. Default On. Output settings are only available, if Capture Output flag is set. In Output Settings dialog you can define where and how tool output will be redirected.